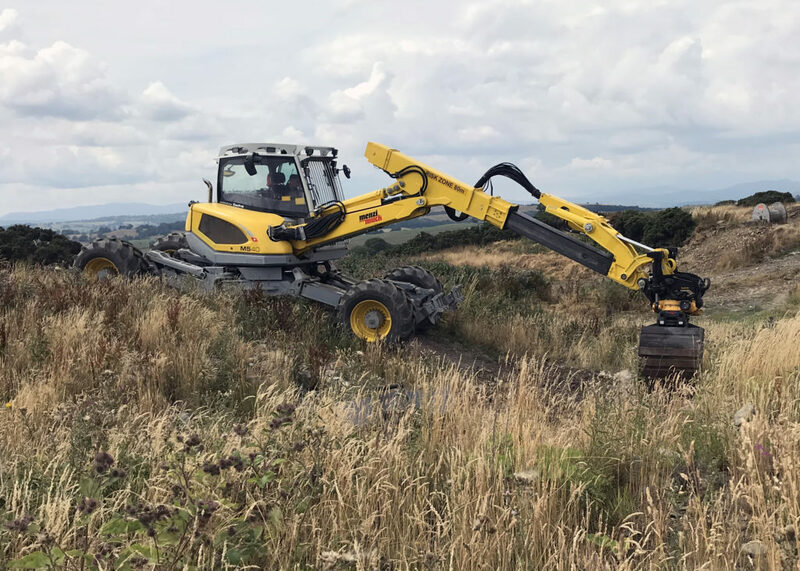 Ground Control, a national, multi award-winning landscaping contractor, has taken delivery of a Menzi Muck all-terrain walking excavator with a fully integrated Engcon EC219 tiltrotator, Q-Safe hydraulic quick coupler and EC-Oil system. The agility and excellent climbing capability of the Menzi Muck excavator means Ground Control’s operatives can work on gradients in excess of 45-degrees. Adding to the excavator’s flexibity, the Engcon compensates for working at this angle. “You could say that having Engcon’s Q-Safe/EC-Oil hitch as part of the package is the icing on the cake,” says Sean. With this innovative system the operator can change hydraulic attachments quickly and easily without having to leave the cab. 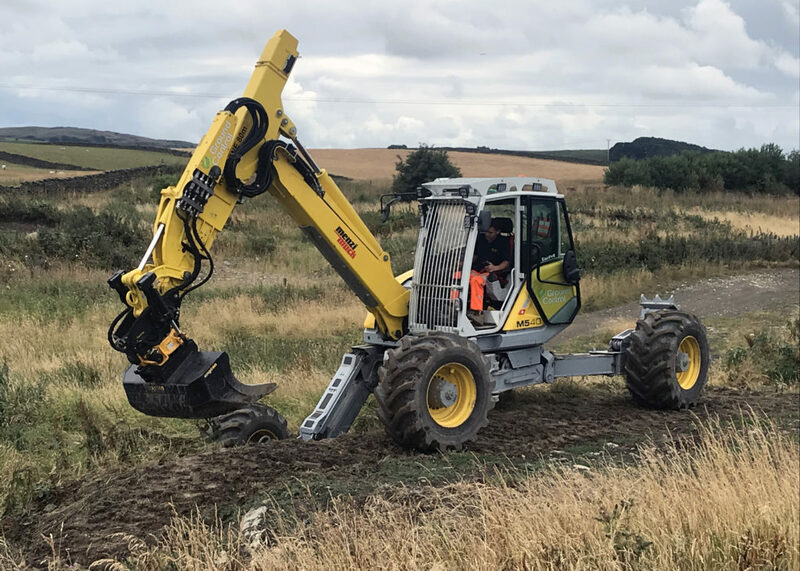 Equally importantly, with EC-Oil there are no external hoses connecting hydraulic tools below the tiltrotator, which means that when clearing vegetation the risks of hose snagging and consequential environmental damage is minimised. “This is a major safety advantage for our team when they are working in potentially hazardous conditions alongside railway tracks and busy highways,” adds Sean. Ground Control specified an EC219 tiltrotator for its new Menzi Muck. This Engcon has a lighter, stronger body with 37 per cent greater breakout force and 27 per cent higher torque than its predecessor. The 360-degree rotation and 45-degree tilt function mean that grading and off-centre digging can be carried out without moving the excavator around. That’s a significant cost saving in normal digging, but a major safety benefit in the rail industry. The Engcon head is also equipped as standard with the newly developed swivel that allows higher flow rates on additional attachment points. This increases the versatility of hydraulic attachments which can be used, which in turn reduces the number of other specialist machines needed to complete the work. While this is something Engcon users take for granted in everyday excavator work, it’s a good example of how owners and owner-operators are using their investment to differentiate themselves and get ahead of the competition. The tiltrotator is direct mounted, with the company’s Q-Safe hydraulic quick coupler installed underneath. Winning awards for its innovation and outstanding safety, Q-Safe has been specifically engineered by Engcon to make it impossible for an attachment to be connected incorrectly. Its triple-safe technology includes the use of sensors and electronic control of not only the hitch but the whole excavator. Sean is particularly impressed by the visbile and audible alarms, which are activated automatically to alert operatives nearby when a bucket or other tool is being changed. “The system’s fail-safe design is essential when you are working in the safety-critical rail industry,” comments Sean. 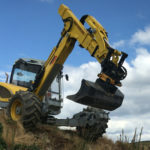 The Q-Safe is configured with EC-Oil, Engcon’s system for connecting the hydraulics and electrical connections of tools and attachments directly from the cab – saving time and improving safety on site. Menzi Muck walking excavators are based on a high-tech chassis and patented boom, together with hydraulically controlled wheels and supports which can adapt to any terrain – earning this agile all-rounder the nickname ‘spider excavator’ or ‘walking excavator’. Ground Control’s machine has been modified to be slew and height restricted specifically for use in the rail and highways industry, so it can’t interfere with overhead power lines or adjacent live traffic. The machine also includes ‘Menzi-Prop’ – Menzi’s own tiltrotator control system.